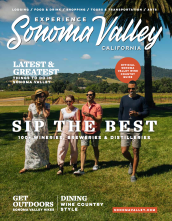 Get outdoors to one of Sonoma Valley’s 13,000 acres of state and regional parks where you can hike, bike, run and experience the serene beauty of wine country. Take a park tour on foot or horseback and view ancient redwoods, historical buildings once the home of Jack London, reservoirs and hiking trails through the vineyards and mountainsides. Stop at a deli and pack a picnic with your favorite cheeses, charcuterie and of course, Sonoma Valley wine, and find your perfect picnic spot to relax and just enjoy your day. Escape from the hustle and bustle of daily life and enjoy the solace of wine country. Find yourself pedaling aimlessly along miles of bike paths that wind through vineyards and farmland, or hiking along the scenic Overlook Trail and multiple state and regional parks. Revel in hot air balloon rides, yoga at peaceful outdoor retreat centers, and canopy tours. Appreciate the beauty and aroma Quarryhill Botanical Garden displays. Don’t miss out on seeing exotic animals and sleeping in a fun and captivating ‘glamping’ room at Safari West. You and your family have many ventures to choose from!